Elmwood Park swarmed with dogs, chickens, rabbits and humans for the 30th annual Earth Day Omaha event on Saturday. Oh, and a BagMonster. David Corbin, a retired public health and health education professor at the University of Nebraska at Omaha, said he wore the costume to raise awareness about the upcoming Omaha City Council vote on whether to ban plastic bags from Omaha’s grocery stores, bakeries and other places that primarily sell food. Corbin is the president of the Nebraska Chapter of the Sierra Club, and he also received Earth Day Omaha’s Friend of the Environment Lifetime Achievement Award at the event. Read more here. David is also a member of Nebraskans for Solar’s Board of Directors. 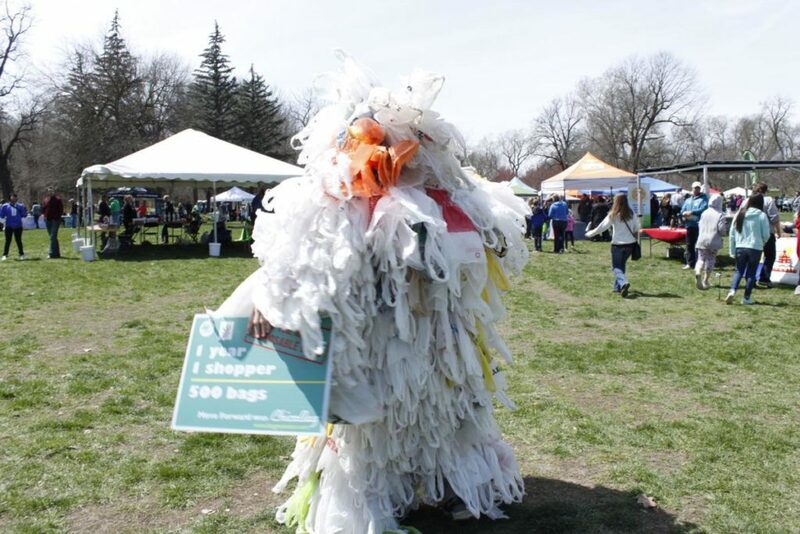 This entry was posted in Nebraska / Midwest News and tagged 30th Annual Earth Day Omaha, Cate Kelly, Earth Day Omaha, Earth Day Omaha's 2019 Friend of the Environment Lifetime Achievement Award Recipient: David Corbin, Earth Day Omaha's Friend of the Environment Award, Nancy Scott, Omaha World Herald, Saving Grace, University of Nebraska Medical Center on April 14, 2019 by Helen Deffenbacher.